Born in 1961, Gilles Rabin is a Doctor of Economics and a graduate of the Institut Français de Presse (IFP) at Paris II Assas University. In 2015-2016, he was Advisor for innovation and space to Thierry Mandon, the Secretary of State for Higher Education and Research. Before that, he founded a start-up specializing in strategic consultancy to local authorities and businesses, and was a research fellow at the Pacte Territoires laboratory at the University of Grenoble. Gilles Rabin began his career in 1989 as Director of Transport and Deputy Director of Local Development at Bipe Conseil, a subsidiary of the Caisse des Dépôts et Consignations, France’s principal public financial institution Here, he developed a broad range of expertise in transport matters and worked in land planning before becoming Deputy Director at the Nancy urban planning agency in charge of economic development and the Nancy-Brabois high-tech hub in 1996. Between 1999 and 2008, Gilles Rabin was Chief Executive of the Essonne regional development committee and worked to promote firms in partnership with laboratories at the Genopole genetics cluster, the Supelec electrical engineering school, the INT national telecommunications institute and the Ecole Polytechnique engineering school among others. Here, he also signed a partnership with MIT before joining the Grand Lyon borough council in 2008 as Delegate General for economic development and land-ownership policy, focusing his efforts on business development, innovation and attracting inward investment. From 2012 to 2014, he was Advisor at the Ministry of the Economy, Productive Recovery and Digital Technologies, in charge of decentralization, innovation, mid-tier firms and start-ups, and the transport and health sectors. Gilles Rabin is CNES’s Chief Economist, responsible for studying the impact of the space industry and the agency’s actions on the national and international economy, and for strategic collaboration with local and regional authorities, competitiveness clusters, university space centres and engineering schools. A renowned expert in innovation working with incubators and investors, he is helping to get local authorities and institutions behind CNES’s innovative projects. On 28 August 2017, Gilles Rabin was appointed Director of Innovation, Applications and Science by CNES’s President Jean-Yves Le Gall. 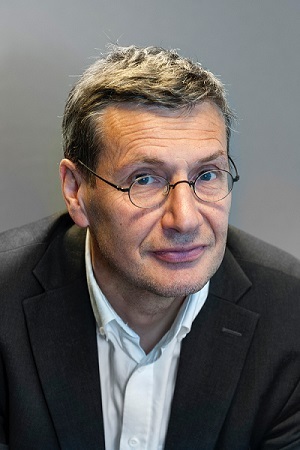 President and thereby Director General of CNES, Jean-Yves Le Gall has appointed Gilles Rabin as the centre’s new Director of Innovation, Applications and Science. The appointment follows that of Lionel Suchet as CNES’s Associate Director General and is effective immediately. CNESMAG 73 is now available online!